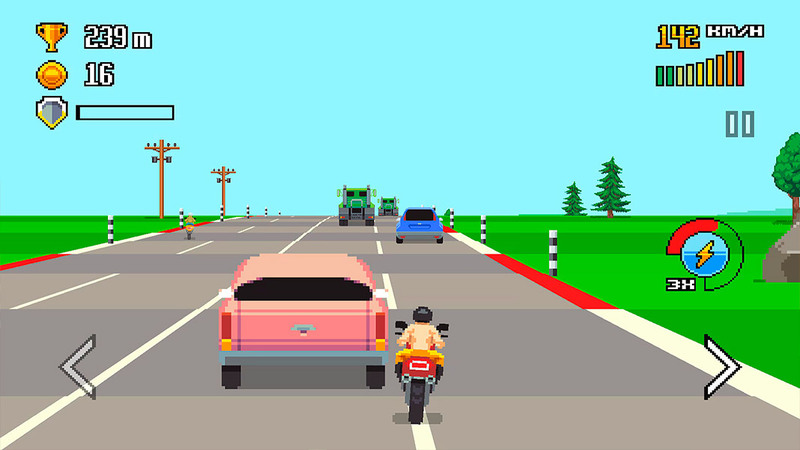 Retro Highway is an incredibly fun motorcycle racing game for Android that takes its inspiration from classics like Hang-On. The passion for all things retro seems like it’s here to stay. New games are popping up all the time that copy the gameplay or audio/visuals of old-school titles, although there are others that use inspiration from these retro games to take them to the next level. 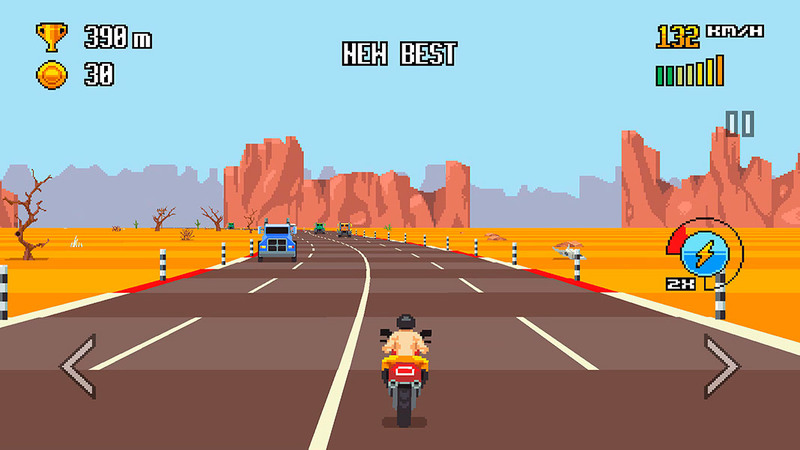 Retro Highway is a sort of tribute to all the motorcycle racing games that have come before it, with Hang-On being one of its main references. 1985 was the year that the young Yu Suzuki directed his second videogame: Hang-On. For those unfamiliar with the title, Hang-On is a legendary arcade game where players drive a motorcycle full-speed while the blue sky fills up a good part of the screen. Something that became one of the hallmarks of SEGA and Yu Suzuki, just like we would see later in Enduro Racer and the ever-glorious Out Run. Retro Highway is now available on mobile devices to bridge the gap between the past and present racing games. Retro Highway has you drive as long as you can in different settings until you inevitably crash and have to start over from scratch. 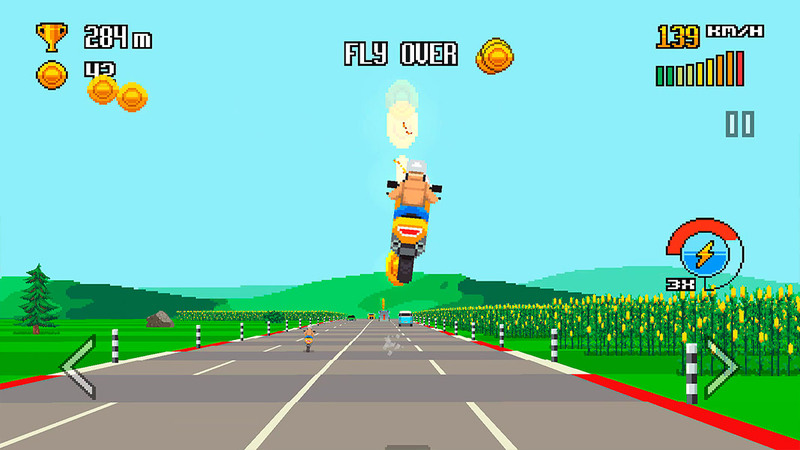 It’s a fun motorcycle game that we could almost define as an endless runner and that has simple controls: all you have to do is tap the left or right side of the screen to move in either direction. Plus, you have a turbo button to give you a boost of speed. As we’ve come to expect from mobile games, there are a few unlockable items that give the game more depth: you can use your coins to buy and improve your motorcycles. To get these coins, you have to collect them along the road or earn them for doing certain actions like passing close to other vehicles or driving over moving ramps around the tracks. To unlock more settings you just have to complete the objectives the game requires. It’s an interesting way to get more things in the game without having to pay any real money, which is always nice. Retro Highway is an incredibly fun game that makes you want to beat your own record every time you play. It’s a racing game that intoxicates us with its retro style. And hey, we won’t judge if you shed a tear or two in a sudden fit of nostalgia. That said, the game has some polished graphics that don’t even compare to the giant pixels from the 1980’s. You definitely won’t be able to put this one down.